Chelsea LE701 is based on an antique patterned meat plate by John Dimmock & Co that we have called 'Calico'. We auctioned the first 10 of this edition on Ebay in December 2017 to raise funds for the Grenfell disaster charity appeal and thanks to the amazing generosity of our collecters were able to send a cheque for over £700. The remaining 90 plates went on sale in March 2018. The Stokesay Ware range of Chelsea plates for doll's houses are real plates in miniature. 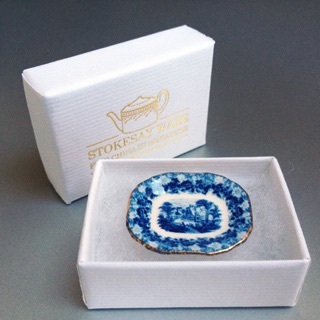 We handmake them ourselves here in London from bone china clay which is fired, then glazed and fired again. The decoration of coloured ceramic enamels and 22ct gold is applied separately and permanently fired on in the kiln. We also draw our own artwork so each part of the process is our own.